Sonos Beam is small enough to fit in any room but provide rich and powerful sound. It works with plenty of third-party audio and video streaming services, has Alexa built-in, and works with AirPlay 2. 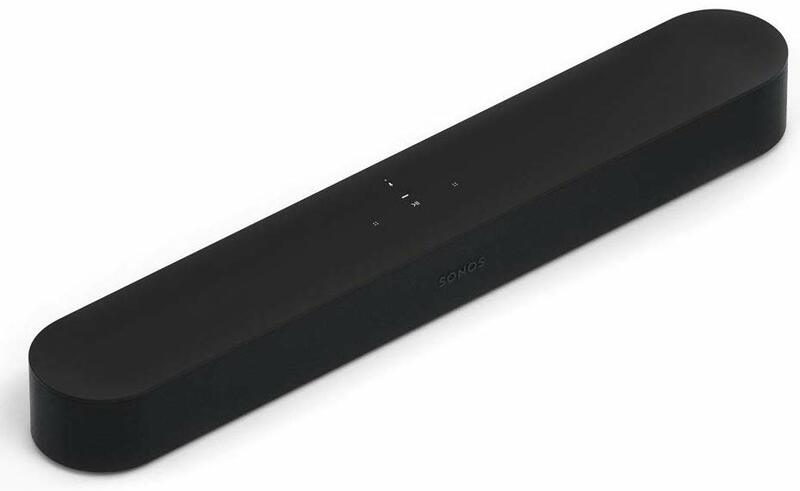 If you are looking for a powerful but still reasonably priced soundbar for your television, then the Sonos Beam is a great option to consider. The Beam looks sleek and modern, and will fit anywhere without requiring a lot of extra space. It fills small to medium sized rooms with high quality sound, and the Speech Enhancement feature delivers more audible dialogue. Plus, it's easy to set up, just requiring an HDMI-ARC connection through the TV and the Sonos Controller app. Is it a good time to buy the Beam? The Beam came out in 2018 (this year at the time of this writing), so it's still a fairly new product from Sonos. That means that it'll be supported for quite some time and comes with the latest awesome features, like built-in Alexa and Siri through AirPlay 2. Speech Enhancement feature makes dialogue sound better. Siri voice controls through AirPlay 2 are limited to audio and playback only. The Sonos Beam may be one of the newer options from Sonos, but it's definitely our favorite for several reasons. First, the Beam's small and compact size make the soundbar perfect for pretty much any room without requiring more space or a new setup. It should fit nicely on your existing TV stand in front of the television, so most likely, no separate shelf is required. Despite the small size, the Beam will fill up the entire room with amazing sound thanks to powerful woofers and tweeters. So whether you're watching something on the TV, streaming music, or listening to an audiobook or podcast, you'll hear it, no matter how close you are to the soundbar itself. Sonos Beam is small and fits anywhere, packs in powerful sound, and has Alexa built-in and works with Siri. The Beam is also equipped with far-field microphones, so it'll pick up your voice for voice control, no matter where you are in the room. Alexa and Siri also work interchangeably, so you can start off using one but switch to the other without any issues (although commands are limited on Siri through AirPlay 2 and you need a connected Apple product in order to use it). Sonos also equipped the Beam with its new Speech Enhancement feature, which boosts audio frequencies that are associated with the human voice. This means dialogue in movies and shows become easier to hear, without making sound effects too loud. You'll never ask, "what did they say?" again. While the Beam itself doesn't have surround sound, you can optionally go for the surround sound setup with a pair of Sonos One, Play:1, Play:3, or Play:5 speakers, sold separately. Even without the surround sound setup though, the Beam itself has excellent sound quality that doesn't disappoint. The Sonos Beam is best for most people, but if it doesn't meet your specific needs or you want more powerful sound, Sonos still has you covered. If you have a larger room and want a super powerful sound that will shake the room up a bit, then the Playbar beats the Beam any day. However, it needs a bit more setup to work with Alexa since it's not built-in. The Playbar is bigger than the Beam, but it packs in even more drivers that deliver much better sound. If your TV is in a larger size room, then the Playbar will easily fill that space, whereas the Beam might struggle a bit. However, the Playbar doesn't have Alexa built-in, so you need an Amazon Echo or Echo Dot with the Sonos Skill to use Alexa with the Playbar. The Playbar is also much larger, and may require its own shelf or mount, but it works both horizontally or vertically. The Sonos Playbase can support up to 75 pounds on top of it and it virtually disappears with your TV while providing amped up sound for your home theater system. The Sonos Playbase is another great alternative to the Beam if you don't mind the high price tag. Your TV can sit on top of it, and it blends in with your setup. You'll get super rich, theatrical sound from the Playbase, and it can be connected to an Alexa-enabled device for voice control. Overall, we enjoy the Sonos Beam a lot. It's small, requires literally no space compared to the alternatives, yet packs quite a punch in terms of sound quality. It may not be as powerful as the Playbase or Playbar, but will fill up small- to medium-sized rooms just fine. Plus, it can be turned into a surround sound setup with a pair of Sonos Ones, Play:1, Play:3, or Play:5 speakers. Christine Chan grew up with classic consoles as a child and loves getting her hands on anything retro and video-game related. You can find her on Twitter with random ramblings and Instagram for amateur iPhoneography shots of her husky, Wolf.